Jennie Kwok Ed 703.22 Spring 2009. 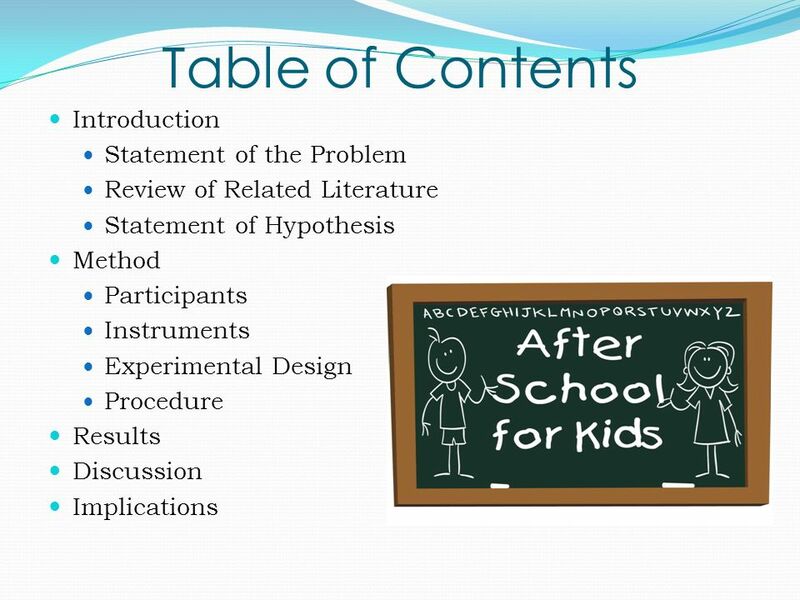 Table of Contents Introduction Statement of the Problem Review of Related Literature Statement of Hypothesis Method. 3 Statement of the Problem Due to an increase number of parents entering the work force, there is a great need to place children in after-school programs that enrich their academic and social development. 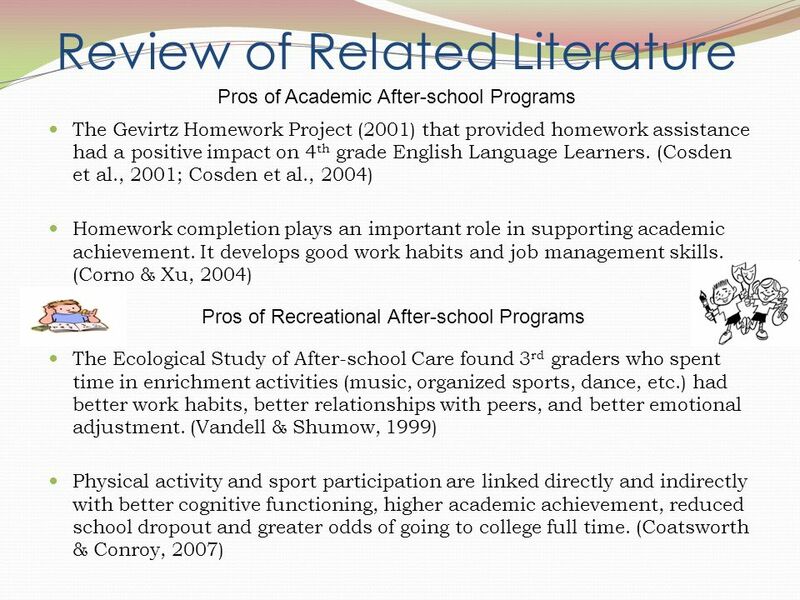 After- school programs can focus on academics or recreational. 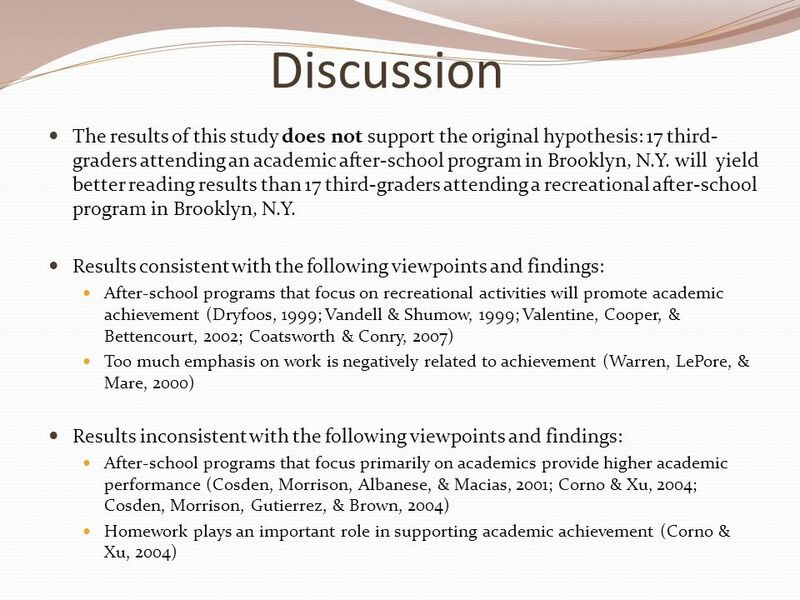 However, it is not clear which after-school program promotes academic achievement. 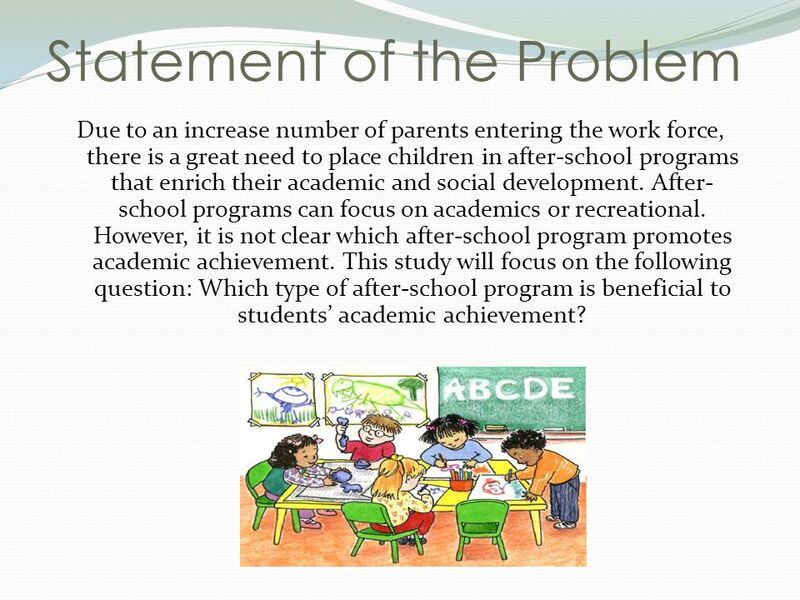 This study will focus on the following question: Which type of after-school program is beneficial to students academic achievement? 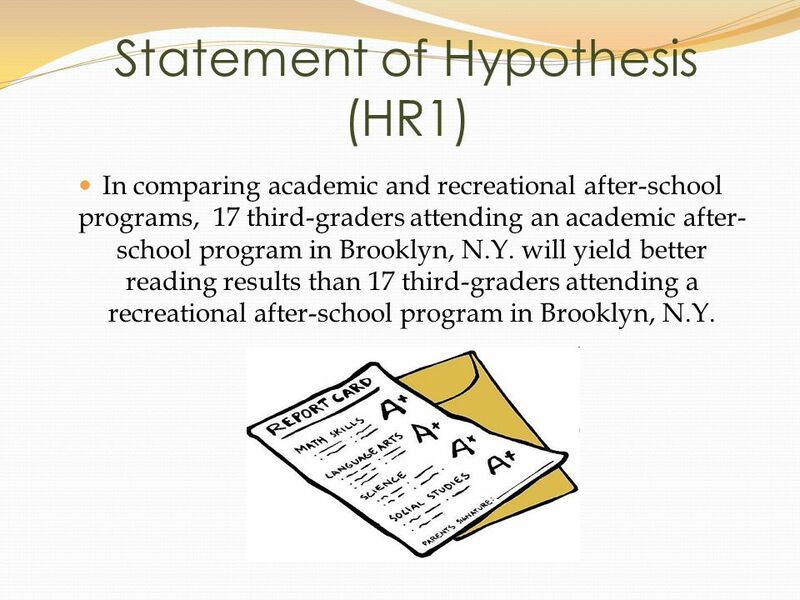 7 Statement of Hypothesis (HR1) In comparing academic and recreational after-school programs, 17 third-graders attending an academic after- school program in Brooklyn, N.Y. will yield better reading results than 17 third-graders attending a recreational after-school program in Brooklyn, N.Y.
11 Threats to Internal/External Validity Threats to Internal Validity History – Classroom teacher came into the room and the phone rang when participants were filling out their attitude survey. Instrumentation – Questionnaires were self-created by researcher. Selection-Maturation Interaction – Participants may mature differently than others. 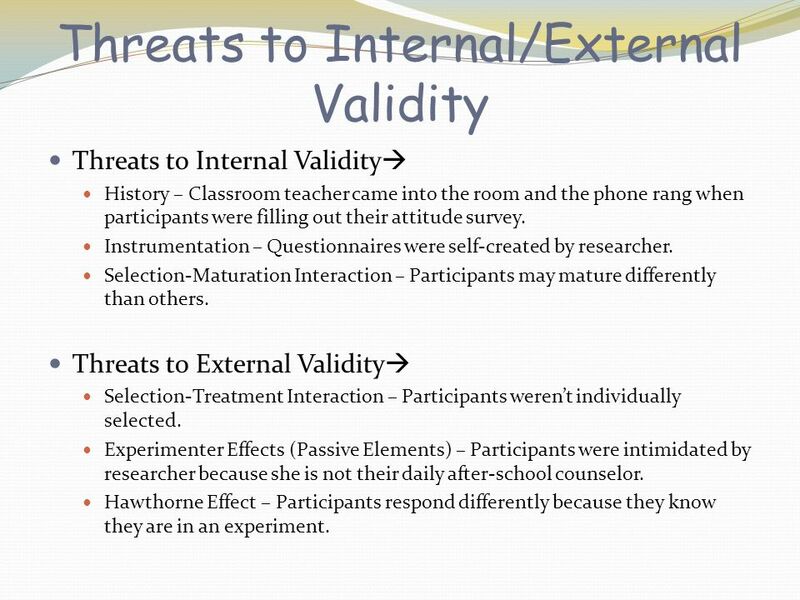 Threats to External Validity Selection-Treatment Interaction – Participants werent individually selected. 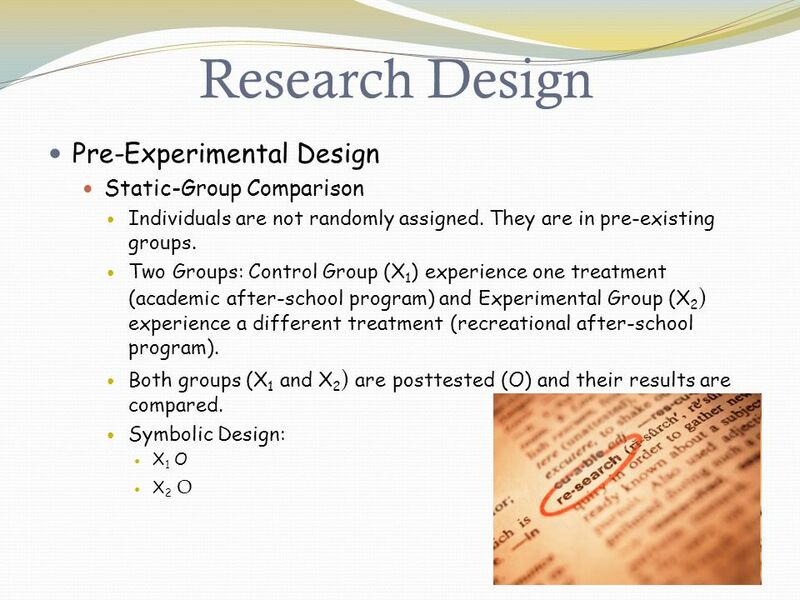 Experimenter Effects (Passive Elements) – Participants were intimidated by researcher because she is not their daily after-school counselor. Hawthorne Effect – Participants respond differently because they know they are in an experiment. 12 Procedure Study implemented between March 2009 – April 2009. 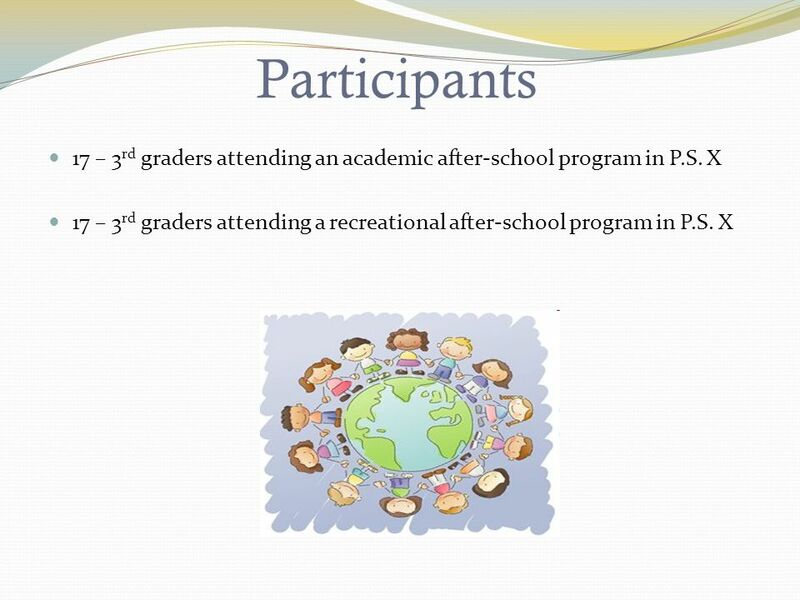 Prior to the study, participants have been exposed to academic assistance (homework help/tutoring) and recreational activities (dancing, organized sports, arts & crafts) for five months in their after-school programs. Parental consent forms distributed in March 2009 and April 2009. Three different sets of reading comprehension exams were distributed for three consecutive days (one for each day). Attitude and demographic survey distributed on the fourth day. Exams and surveys were graded and analyzed. 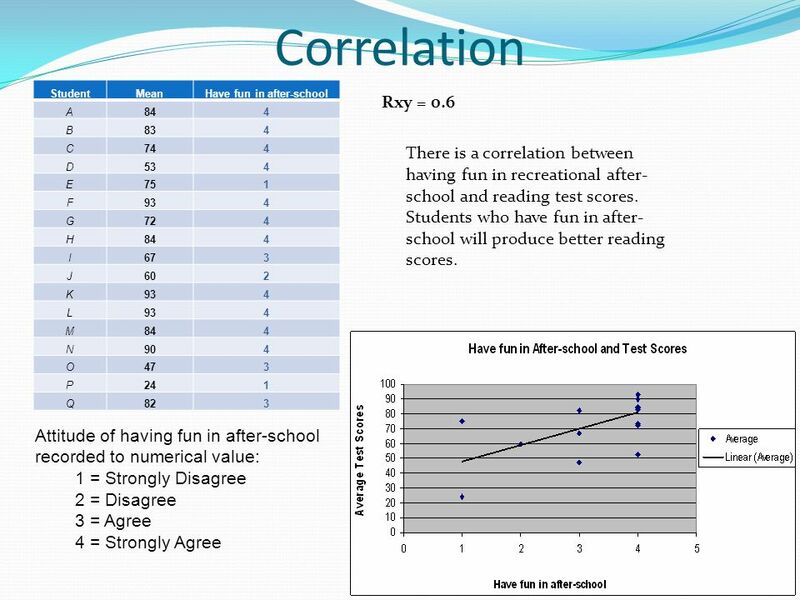 14 Correlation Rxy = 0.05 There is no correlation between the amount of time spent reading and test scores in the academic after-school program. 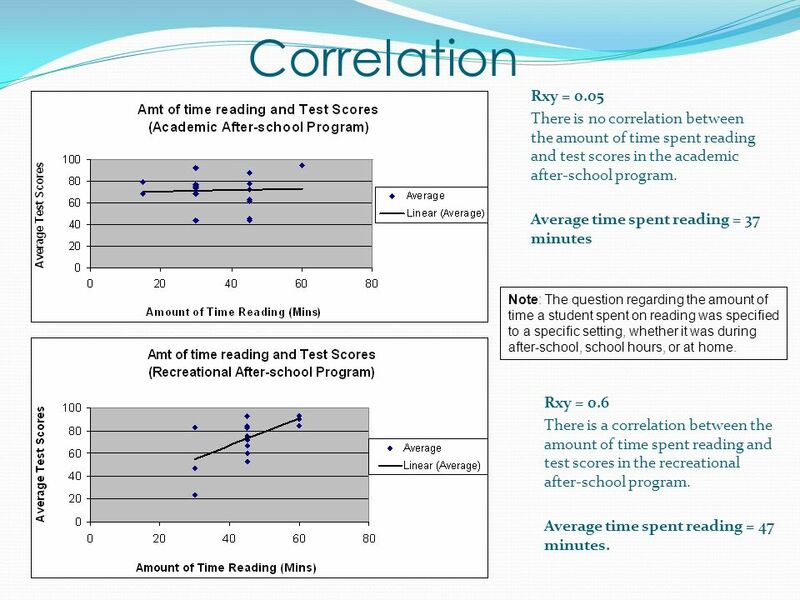 Average time spent reading = 37 minutes Rxy = 0.6 There is a correlation between the amount of time spent reading and test scores in the recreational after-school program. Average time spent reading = 47 minutes. 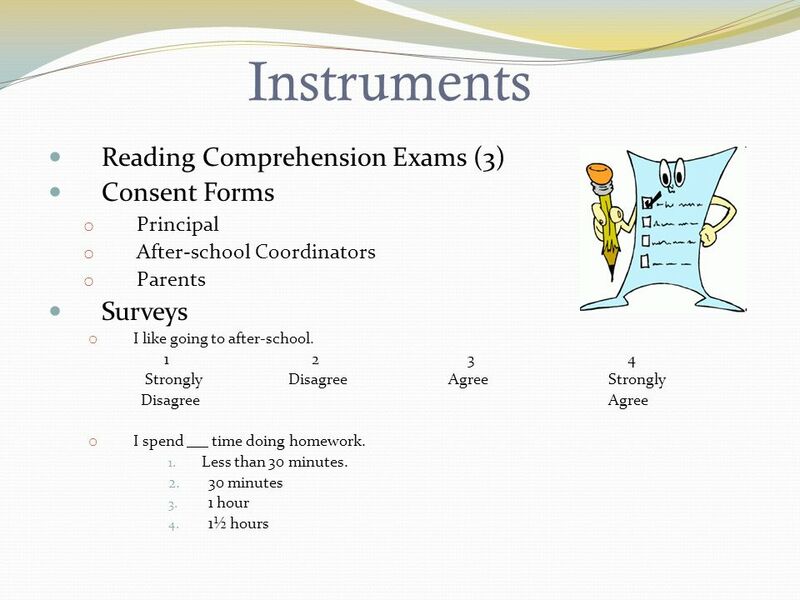 Note: The question regarding the amount of time a student spent on reading was specified to a specific setting, whether it was during after-school, school hours, or at home. 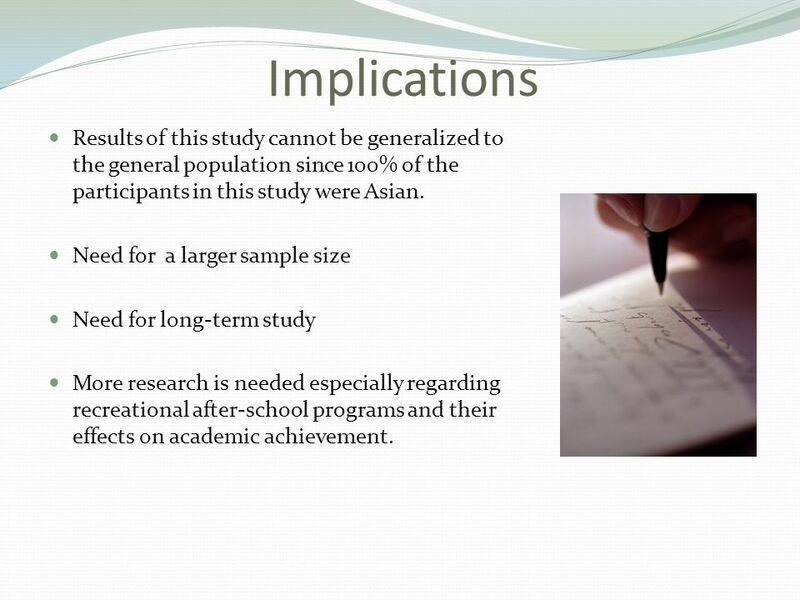 18 Implications Results of this study cannot be generalized to the general population since 100% of the participants in this study were Asian. 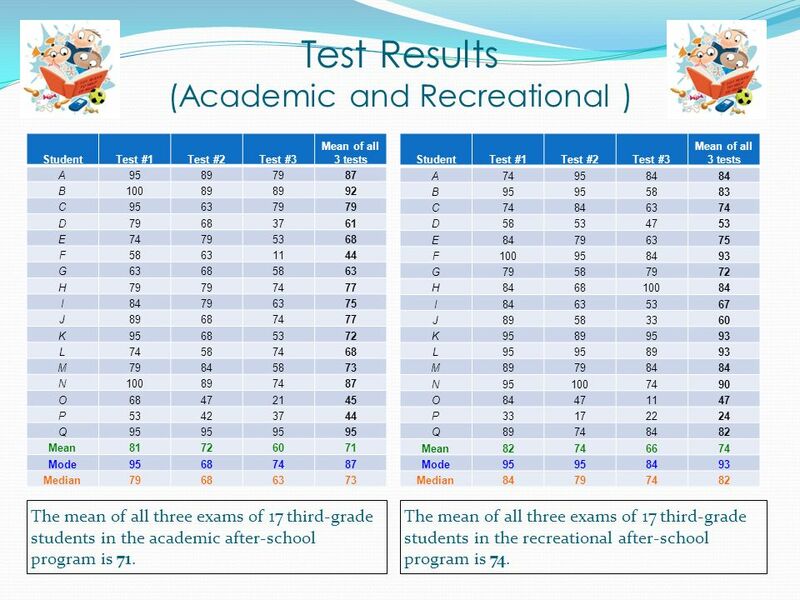 Need for a larger sample size Need for long-term study More research is needed especially regarding recreational after-school programs and their effects on academic achievement. 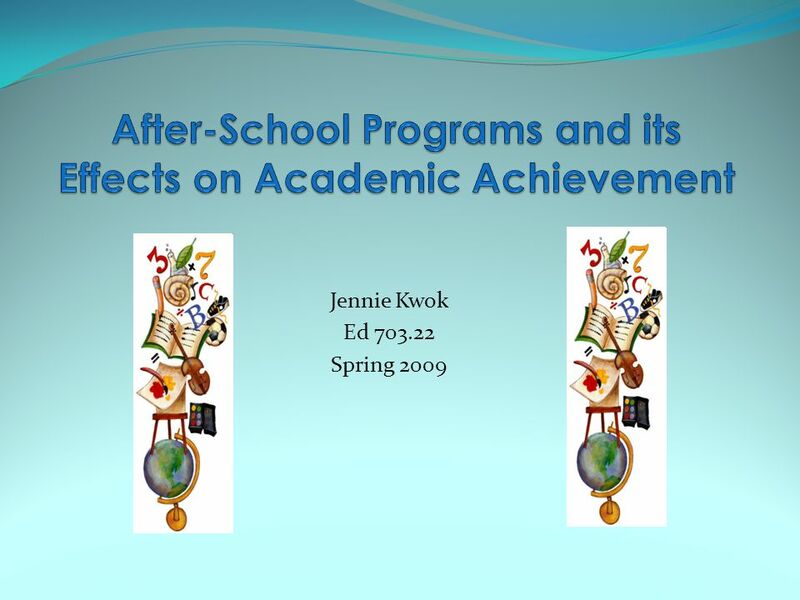 Download ppt "Jennie Kwok Ed 703.22 Spring 2009. Table of Contents Introduction Statement of the Problem Review of Related Literature Statement of Hypothesis Method." 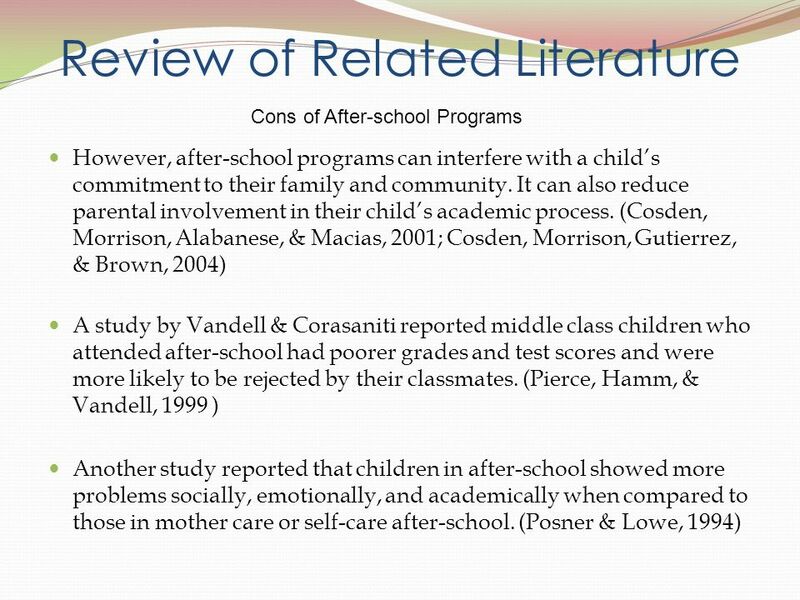 After-School Programs and its Effects on Academic Achievement Jennie Kwok Ed Fall 2008. 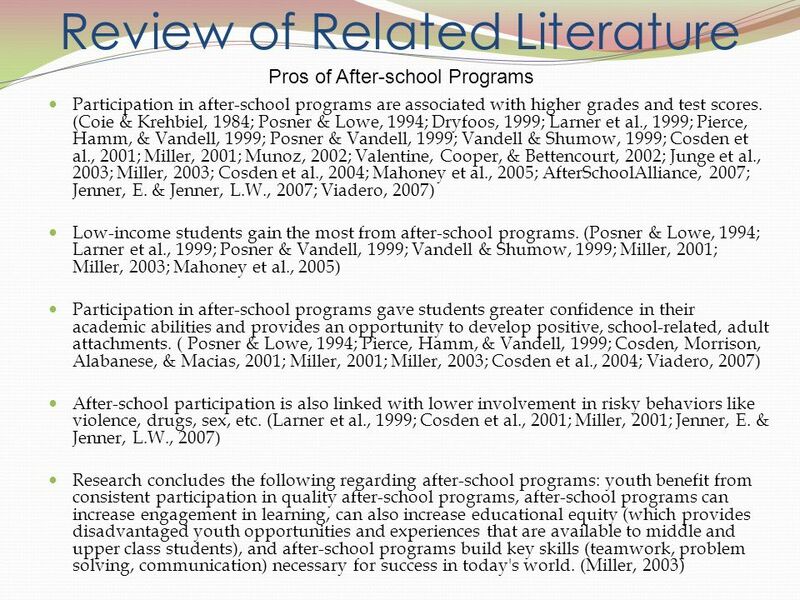 After-School Programs and its Effects on Academic Achievement Jennie Kwok Ed Spring 2009. English Language Learners: Writing Development. Table of Contents Introduction -Statement of the Problem -Review of Related Literature -Statement of the. To Act, Or Not To Act? Drama In The Classroom Lauren E. Duerson ED-7202 Spring 2012. Tail Waggin’ Tutors: Effects of Dogs on Reading Scores By Bridget Anton, Christina Guentert, Hannah Krotulis. The Effects of Single-Parent Households on the Literacy Achievement of Third-Grade African-American Students Stephanie Bryant Professor O’Conor-Petrusso. Deandra Henderson Seminar in Applied Theory & Research 1 Ed – Fall 2009. Effect of Home Dynamics and Parental Involvement on School Achievement and Behavior By: Katie, Courtney, & Christine By: Katie, Courtney, & Christine. Utilizing PBS “Cyberchase” Math Computer Games with Struggling Math Students Michelle Brennan Education 7202T Seminar in Applied Theory and Research II. Community Schools in your city!. What are community schools?  Parents and community members are leaders in a team to design a plan for the community. Effective Strategies for English Language Learners in Science Melinda Moya Spring 2012. The Workshop Model: Optimizing the Mini-lesson By: Lori Grabel & Klarisa Konstantinovsky Education – Spring 2009 Dr. O’Connor- Petruso. Why Theater and Music Matter? The study of how the integration of Theater and Music in the classroom shows an increase in students’ attention span. Kirsten. Cognitive Ability and Breakfast:Collaborating with Parents to Promote Balanced Breakfasts ED 703.22 Spring 2010 Seminar in Applied Theory and Research.